This kitin hunter is recognizable by its huge mandibles and small abdomen and dorsal excrescence. The kincher precedes other kitins into unknown territory to pinpoint precious resources. Munches and analyzes everything in its path, selecting and marking the best materials. This kitin fighter occurs all over Atys. Naturally Immune to Acid magic, Slow Movement, Slow Attack and Stun. Highly resistant to Rot Magic. Partially resistant to all other forms of elemental magic. Can discharge electricity when attacked. 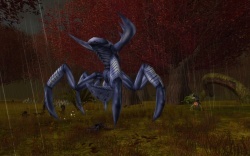 The electric attack unleashed by kinchers can be countered with Melee Protection Aura. Cherkin leading a pack of Kipucka into combat. 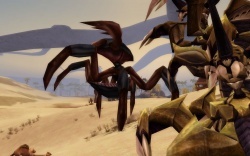 This named kincher can be found in Dunes of Exile, where it preys on the unwary. Its build and appearance does not differ much from the other specimen of kincher to be found in the Desert. It is most feared by the many diggers in the immediate area of Dyron. 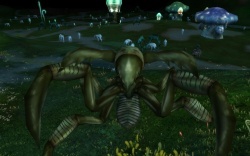 The Matis Exterminator is a powerful level 280 kincher, which can be found in the Upper Bog, Verdant Heights. It can only be seen during kitin invasions. When killed the Matis Exterminator drops a special token which can be used to earn a Matis Guardian title. In addition to the token, it can also be quartered for Supreme grade, q250 materials. One of three kinchers sharing the same name wandering the depths of Atys. In recent years, Kincher infected by the Goo have been seen in the Witherings. Unlike most other animals and kitin, kinchers can spot enemies from 30 meters away, making them harder to sneak past than other aggressive creatures. This page was last edited on 29 August 2012, at 13:41.